What are the benefits of using glass water bottles? If you are carrying a reusable water bottle, gold star for you! Now, we’d like you to take that commitment one step forward and up your game from plastic to glass. Protecting your health and caring about the environment are just two of the reasons why you might want to consider switching from plastic water bottles to glass bottles. The latter is not only more eco-friendly, but offers a superior choice for taste, is aesthetically beautiful, and is better for your health. Glass bottles keep filtered water fresh and pure without the risk of chemicals contaminating the water. Glass bottles are much easier to clean and will retain their clarity after hundreds of washings. Even days or weeks after filling up a glass bottle and putting it in your refrigerator, you can enjoy the clean, crisp taste of filtered water with no worries about BPAs and other chemicals leaching into your water. Unlike plastic, your glass water bottles will remain crystal clear when you infuse your filtered water with lemons, oranges, limes, and other fruits that cause plastic bottles to become discolored and degrade. The production of one plastic bottle uses energy, omits toxins into the air, and uses more water to produce than the amount of water put inside the bottle for drinking! Manufacturing companies use millions of barrels of oil every year to create plastic bottles. In the U.S. alone, the amount of oil needed to meet this demand is enough to fuel 1.3 million cars every year. Only a small percentage of plastic water bottles are recycled after use – on average this equates to just 38 of 167 disposable water bottles. Billions of water bottles go to waste every year, occupying large volumes of landfill and polluting the nation’s waterways. Do Plastic Water Bottles Pose Health Risks to Humans? According to numerous studies, polycarbonate plastic gradually leaches a chemical called bisphenol-A (BPA) into foods and liquids that are stored in water bottles and other containers made from this material. BPA has been identified as an endocrine disrupting chemical, or a chemical that easily mimics hormones when absorbed by the human body. PET is a thermoplastic polymer resin of the polyester family, used in beverage, food and other liquid containers. Although industry experts stand behind the safety of this product, there is documentation of potential health risks. Antimony, a compound found in PET plastic bottles can cause dizziness and depression in small doses; in larger doses it can cause nausea, vomiting and even death. German researchers said that if you drink water from plastic bottles manufactured from PET, just like with BPA, you have a high probability of drinking estrogenic compounds. Consider buying Aquasana glass bottles with BPA-free blue tops. They are not only pretty and sturdy, but will keep filtered water fresh and pure, without leaching chemicals into the water. 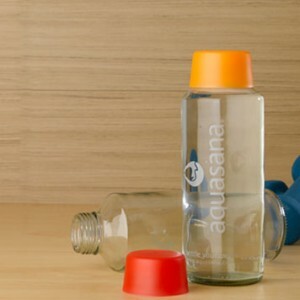 If you are worried about taking these to the gym or office, Aquasana sells single bottles wrapped in a protective silicone sleeve, or you can purchase the bottles and sleeves separately in multipacks. Read more about how glass water bottles compare to plastic and stainless steel options!